Riddle Me This: What's an Expensive Video Game Collectible That's Really a Video Game Collectible? Now that you've spent dozens of hours collecting the virtual Riddler Trophies in Batman: Arkham City, why not spend several hundred dollars collecting a real one? 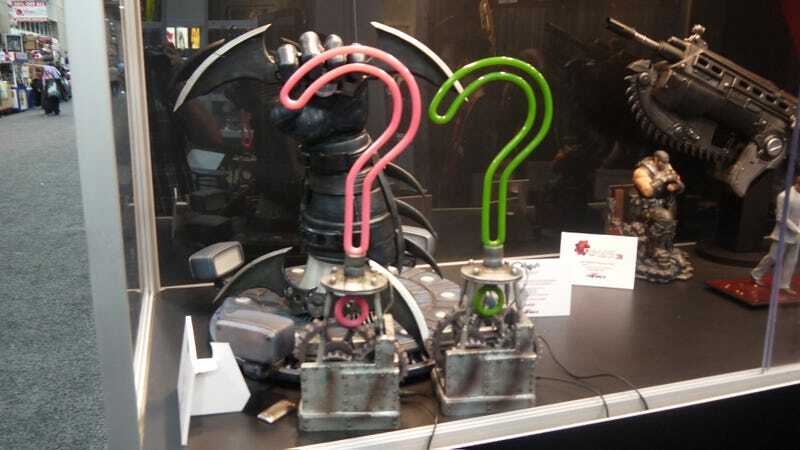 By far the most novel video game collectible I've seen at San Diego Comic-Con so far, the Riddler Trophies from Project Triforce, creators of fine video game weapon replicas, switch gears from objects that shoot bullets to those that tease the brain. Measuring 19-inches tall and weighing an impressive eight pounds, these polystone beauties feature LED lights to give off that telltale glow to let things that go boom, crash in the night know that there's a challenge ahead. The challenge, in this case, is getting your hands on one of the pink Catwoman variants. Though priced at a hefty $400 — $50 more than the 440 green ones being produced — Project Triforce suspects the entire 100 piece run will sell out in short order. It's always neat to see a collectibles company think outside the box like this. They've earned their Riddler Trophies. To earn (and learn more about) yours, hit up the company's website.